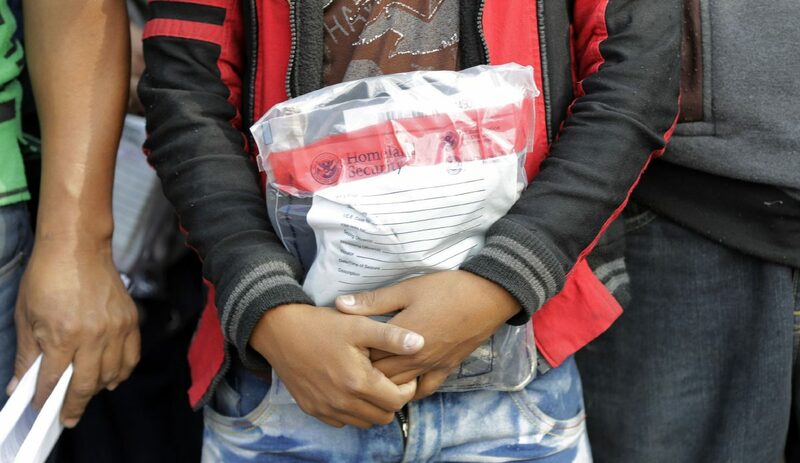 In this Friday, June 22, 2018, photo, a young immigrant holds his belongings in a Homeland Security bag while waiting to enter the bus station after being processed and released by U.S. Customs and Border Protection, in McAllen. Immigrant rights groups are asking for information surrounding the detainment of migrant parents who were separated from their children after crossing the U.S.-Mexico border in late May. The U.S. Department of State must furnish by Wednesday nearly a dozen pieces of detailed information to the Inter-American Commission on Human Rights surrounding the detainment of migrant parents who were separated from their children after crossing the U.S.-Mexico border in late May. The decision comes three weeks after a group of mostly Texas-based attorneys filed an emergency request on behalf of the families with the IACHR demanding this information from the Trump administration. Among the currently undisclosed details are the physical and psychological condition of the five parents and seven children named in the request; the facilities where they are being held; whether any of the parents have been deported, with or without their children; and reunification plans, if any. The Washington-based commission on Friday notified the petitioners — Alamo-based Texas Civil Rights Project, McAllen-based Garcia & Garcia law firm, the University of Texas School of Law’s immigration clinic and the Washington-based Women’s Refugee Commission — that it had formally requested the U.S. government provide it with specifics surrounding the families. Since the initial filing, 376 families have been added to the request. The Trump administration will likely ask for more time to provide IACHR with this information, said Efrén Olivares, TCRP’s racial and economic justice director. Once the commission receives the necessary information from the government and petitioners, it will issue a ruling on the emergency request, which asks that IACHR demand the U.S. government put an immediate end to separating migrant families and reunite all those that have been separated, a result of the Trump administration’s “zero tolerance” policy. Enacted in April, the policy seeks to criminally prosecute all adults who cross the border illegally, which spurred the separation of children, who are sent to detention centers and shelters, from their detained parents, who await their day in federal court. Under international law, Olivares said, children can only be separated from parents if it is in the child’s best interest, exceptional (not systematic) and temporary, which is why the petitioners believe the policy violates international law. Despite President Donald Trump signing an executive order last Wednesday demanding the government stop separating migrant parents and children, “zero tolerance” remains in effect according to a top U.S. Customs and Border Protection official.